Aith lies at the head of the the broad and well-sheltered Aith Voe. In Norse times there was a settlement here called Aithsting, a name that still appears on the Ordnance Survey map for the area around the village. Aith lies on the "B" road that cuts across from from near Walls, to Voe. 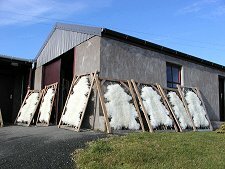 If you are approaching from the south keep a lookout on your left as you begin to descend towards the village for workshops used to prepare sheepskins. Here you can see how the process takes place: and purchase the product at extremely good prices. 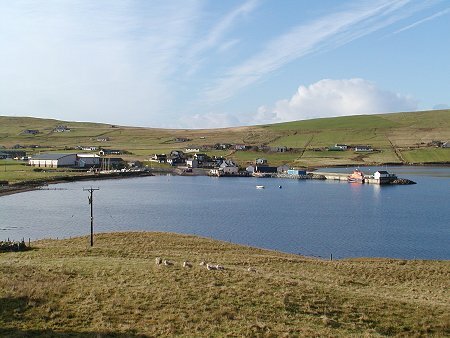 The centre of Aith is bypassed by the road as it sweeps round the south end of Aith Voe. It is well worth taking the short detour into the village. The focus is the marina built in the early 1990s which has proved a great draw for leisure sailors ever since. Nearby is the pier, complete with the lifeboat station and, usually, the Aith Lifeboat. 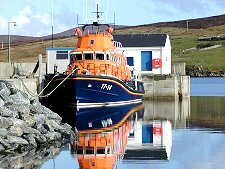 At first sight is seems a little odd to find a lifeboat out of sight of the sea, but this important station has been home to a lifeboat since 1933, providing protection for mariners off Shetland's sometimes wild Atlantic shores. Aith harbour is home to Aith's small fishing fleet and it also services the local fish farming industry, now increasingly important to the economy. 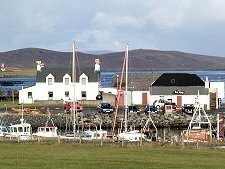 Overlooking the harbour at the landward end of the pier is the Eid Shop, a general store and Post Office. Since the 1960s Aith has served as a centre for services to the wider community in the surrounding areas. As a result it has both primary and secondary schools and a range of other services you'd not normally expect in a village of this size. 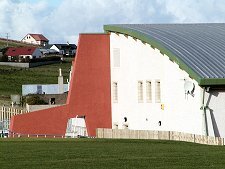 These include the new West Mainland Leisure Centre which dominates much of the village with its sweeping roofline and bold colours. 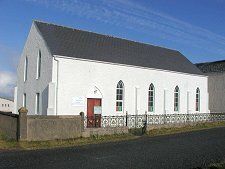 Aith is also home to a tweed mill, and back on the main road you find the white harled Church of Scotland, which also serves the wider community. It is worth stopping at the church, if only to admire the decorative iron railings outside. There are several examples of excellent railings in Aith: another case of Shetland being spared when the rest of the country removed its railings to help build tanks in WWII. The minor road running up the west side of Aith Voe curves north west and finishes at Vementry House. This is home to annual summer schools for traditional Shetland music . It also overlooks the island of Vementry, uninhabited except by the ghosts of those who once occupied its now ruined crofts: or the World War One gun emplacements on its western shore, one of which is said still to house a naval gun.